If you are not using Windows Azure Storage Client Library then to work with Windows Azure Storage you may need to create a WCF Service. Windows Phone will make a call to Service and Service will use Windows Azure Storage library to perform operations on Azure Storage. However using Windows Azure Storage Client for Windows Phone, you can directly perform operations on Windows Azure Storage. After successful creation of project go to Tools then Library Package Manager, you will get option for Package Manager Console. Go ahead and select that option. 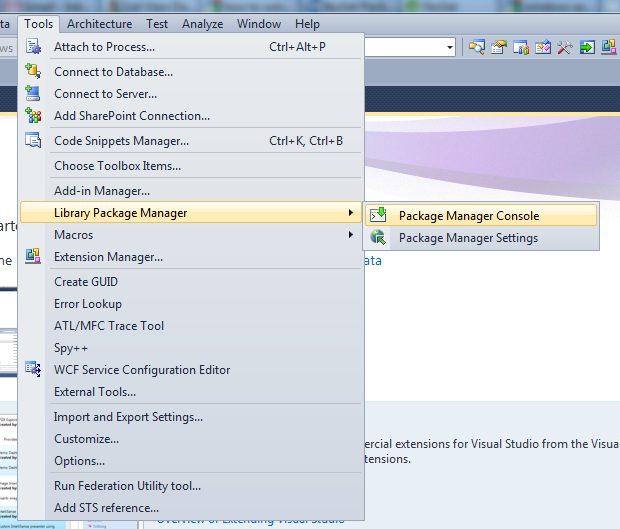 In bottom of Visual studio you will get Package Manage Console. Go ahead and install Phone.Storage package to the project. After successful installation of Phone.Storage package, you should have below references and file in solution explorer. StorageInitializer.cs is very important class. In this class you can set whether you want to perform operation on local development fabric storage or on the azure storage. If you closely look into this file, you will find there are three sections. To configure to connect with local development fabric storage or Windows Azure Storage Emulator. To configure to connect with Windows Azure Storage directly. All the settings are commented but to work with storage of Windows Azure Emulator. If you want to work with Windows Azure Storage directly, you can do that by commenting third section of the file and providing Account Name and Account Key. 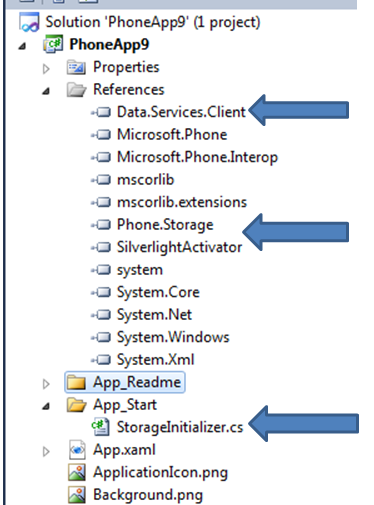 Below is the uncommented section in file StorageInitalizer.cs. You need to provide your Windows Azure Storage account name and key. 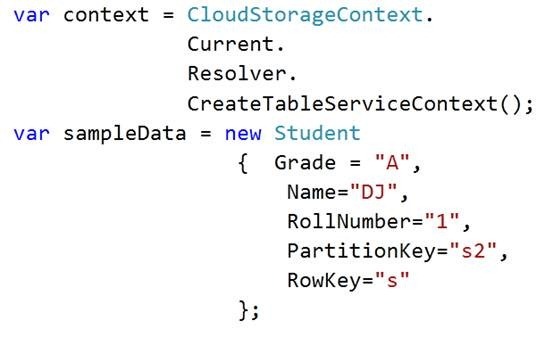 Next let us say you want to create a table called Student. For that add a class called Student. Student entity class is inherting TableServiceEntity class. Next as the design of the page, I have put a button and on click event of the button, Student table will get created if not exist and one row will get added. On the click event of the button, first you need to resolve table client as below. Set the table name. Once table is created you need to resolve the context to add rows in the table. You can very much modify above code by getting value to be inserted from the user. In this case I am hardcoding the vale. On putting all codes together you should have below code behind. Once you run on click event of the button you should able to add row in the table. I hope this post is useful. Thanks for reading. I am also getting FormatException. Alessandro, did you fix it?